We are proud to be innovators... there is no other way to put it. Reverse Correlated Time And Price Analysis (RCTPA) Is our contribution to the Forex industry... it's what will take you from being an average Forex trader to a top-gun, pip-pulling machine. It's the first time Artificial Intelligence has been taken to the next level. Increased Initial Gains From 340.33% To 15,408.37%. Will We Achieve 10,000% Now? Sometimes you have a revolutionary idea... a new concept in mind. You believe in it but, it's still just a concept. That's what happened to us when we developed the Reverse Correlated Time And Price Analysis (RCTPA) theory. You see... when you are an insider in this business you know exactly what the problem is affecting consistent performance. Because Of Single-Market Condition Systems/Robots. The typical scenario: A Forex robot performs extremely well for a certain period of time and then BOOM... you give all your profits away again. Why? Because the market changed. Volatility changed. Behavior changed. Worth The Time It Takes To Download It. Whatever you decide to do in your Forex trading career, always take the above two points into consideration. Trust us, these two rules are non-negotiable! No matter How We Looked At It, The Only Way To Achieve Extremely Accurate “Multi-Market” Condition Performance was by employing a different method of analysis and technology. This knowledge can only be acquired through long term experience, dedication and persistence. 1. Take RCPTA into the next level... 100% automated, hands-free trading. 2. Boost performance to levels never seen in the Forex industry before. Why do we say “never seen in the Forex industry”? Well... you have to understand one very important thing. When you are not known in an industry you can get away with average... you can get away with not being the best. When you have 10's of years of experience AND you are known by key figures in the industry you have to PROVE yourself. In other words, you cannot afford not to be the best. NO... we are not comparing ourselves to these industry-dominating figures, but we're sure you get the point. That it is possible to take what we learned during our 38 years and integrate it into the best Forex robot the industry had ever seen. What is the most important detail you have to understand from these results? No... what is the difference between what you see here and what you will or have seen in ANY other Forex robot performance results? Two things: consistency and incredible individual year performance. If you are new to Forex then you probably don't know the trick... so let us open your eyes a bit.... and please focus here as it's one of the most important lessons you can learn. Well, the claim might be true. The robot might have produced these type of results. Did it have ONE SINGLE period of great performance and that's it? Can you see the difference between a robot producing consistent and even results over a long period of time and producing good results for ONLY a specific period? For us, for the trained Forex professionals, it's obvious... for someone who just started out in this business, it's not. You know the saying “95% of Forex traders Lose... 5% WIN”. Most importantly though, they are able to understand the fact that real long term success is based on “experience-based” system design. My friend, absolutely nothing beats experience... period! “Automated performance of upto 1,000%”... A bold claim? A bold claim is a claim that cannot be backed up by facts... it's a claim that has no solid ground to support it. Not only is this NOT a bold claim... it's a claim that was OUTPERFORMED. Why are the 2009 “account tripling” results so powerful? Fact #2: They are not “stand-alone” results. By this we mean that they are backed by 8 years of similar results in back-tests. 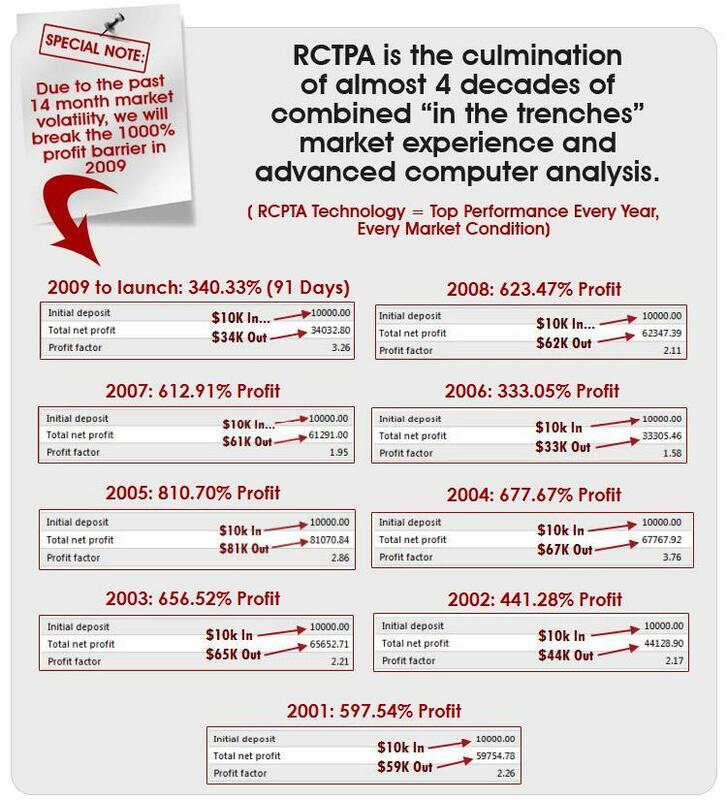 Fact #3: They show INDISPUTABLE proof that the RCTPA technology is the new frontier in Forex trading... they show that it is possible to see into the immediate future with astounding accuracy. The Forex market will not be what it was for a very long time to come. Ok, we know you are now confused so let us explain because it will put YOU light years ahead of every other Forex trader out there. There is one indisputable fact in trading: the market changes personality and over 95% of traders only see this long after the change occurred. You see, every few years the market goes though dramatic changes. Changes in volatility, changes in range, changes in the “time of day” movements occur. These changes can last for YEARS once they occur. From around January 2008 the market was starting to give us signs that it was about to change. In September 2008 it finally put its foot down... it SHOUTED CHANGE! We are in a new reality now. We are in a new reality that is NOT going to change for quite a few years to come. Your future in Forex trading depends on how well the robot you use adapts to the new market realities. The fact is (and we can say this because of our 38 years of combined of trading experience) there is no better time to make a fortune from trading Forex because this reality is here to stay for a VERY long time. II. Of those that can, NOT ONE can see the immediate future and trade it with 95.82% accuracy over a long period of time. Can you drive a normal car over rough terrain? NO. Can you drive a 4-wheel-drive car over rough terrain? YES. Can you drive a 4-wheel-drive car in normal terrain? YES. We can't put it simpler than that! Forex Megadroid is a “4-wheel-drive car”... multi-terrain, multi-performance!